Animal control came to collect a monkey from a Toronto Ikea store on Sunday, after the animal was spotted in the parking lot. 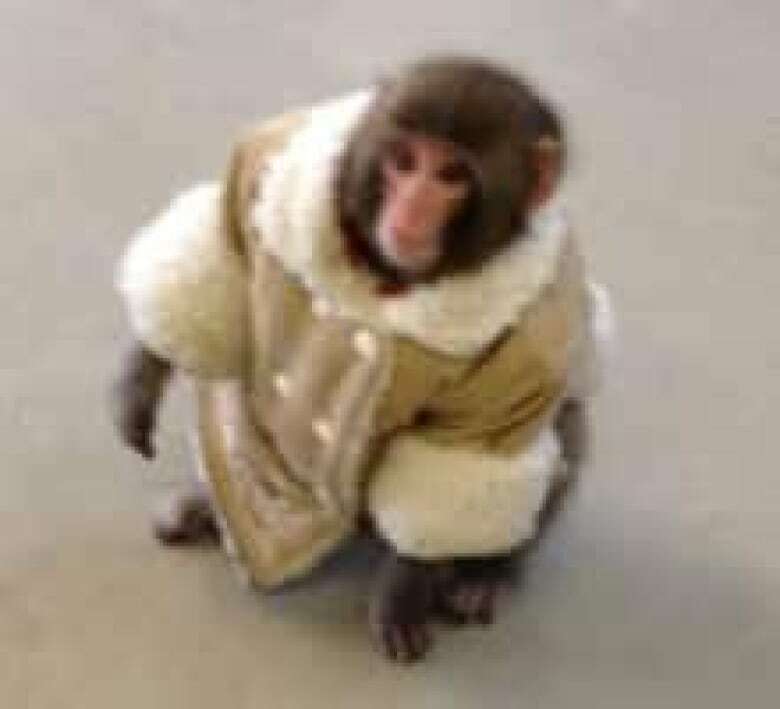 A monkey wearing a miniature shearling coat and diapers was collected by animal services on Sunday afternoon, after shoppers spotted the animal in the parking lot of a Toronto Ikea store. The owners, who were shopping in the store at the time, have come forward to claim the monkey, Toronto Police Sgt. Ed Dzingala told CBC News. Dzingala said that the animal was in a car in the parking lot and it somehow let itself out of its crate. "It's a smart monkey," he said. An Ikea spokesperson told CBC News that the monkey was first spotted in the parking lot of the Ikea store located near Leslie Street and Highway 401. Staff at the store quickly contacted animal control, and the monkey was kept confined until animal services arrived at around 3 p.m.
Shopper Stephanie Yim said she believes she was the first person to spot the escaped monkey. After parking her car on the upper-level parking lot, she saw the animal peeking out from behind another vehicle. "It was the weirdest thing." she told CBC News. "I thought I was going insane." Yim, along with other bystanders, began following the monkey as it skittered across the parking lot. She said that while the monkey didn't appear to be scared, it cried out at times. "It would start 'monkey-screaming,'" Yim said. "It seemed like it was screaming around for someone [it] knew. It was sad." Shoppers eventually alerted Ikea staff, who then contacted animal services. The Canadian Press reported that the monkey was eventually reunited with its owners. Monkeys are prohibited as pets in Toronto, according to the city's Municipal Code. Sgt. Ed Dzingala said that police haven't laid any charges or fines. The incident prompted the creation of at least two parody accounts on Twitter.